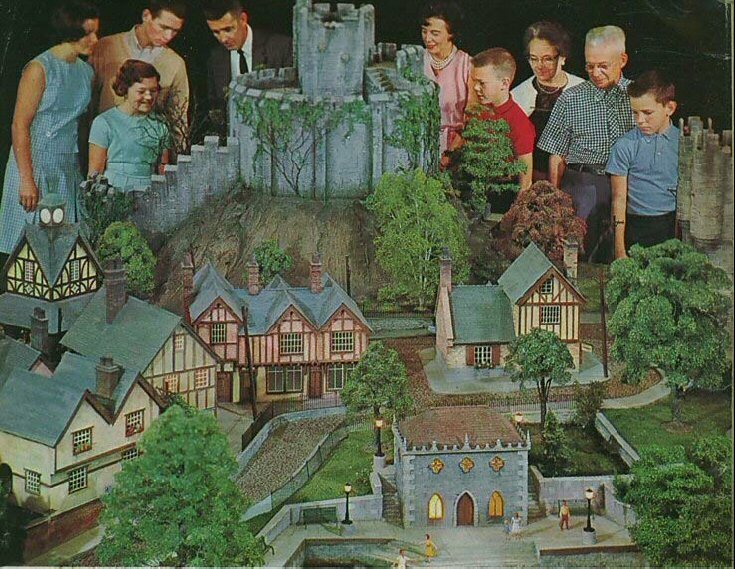 DIMINUTIVE REPRODUCTION above of a Thames-side village in England is one of twelve countries visitors can stroll through in Gulliver-style at the "International Gardens" exhibit at the Ford Wonder Rotunda. Because this unique exhibit helps visitors to understand much of the culture and history of many far-flung lands by providing a realistic, close-up perspective, it also dramatically symbolizes the primary objective of the Fair, stated by its President, Mr. Robert Moses: "'Peace through understanding' is more than an eloquent slogan. We aim to show that on a shrinking globe in an expanding universe, the continents and people draw closer together and must learn to live in harmony."